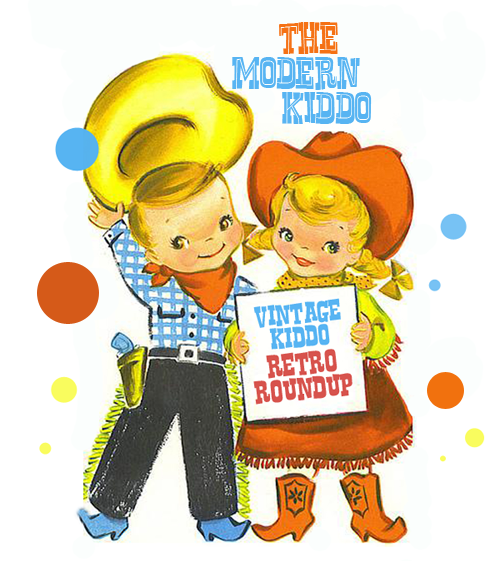 It’s time for another awesome round up! First off, Happy Halloween everyone! Have you carved your pumpkins and put the finishing touches on your costume? We had so much fun this past weekend. Lots of playing and test driving the Peach’s Halloween costume, a cowgirl, which turned quite a few times into a cowgirl ballerina. It’s been a blast. But a weekend isn’t a weekend without a little vintage fun. Sooo, on with the shooooooow! HOO HOO HOO doesn’t love this owly applique jumper? Thanks, Ms. Tips! I know we all love Barbie, but what of Ken? There was a time before his disco dancing days and looking like a member of NKOTB. And he was a man, who enjoyed his own carrying case, thanks much. Not Barbie’s little pink box. Like this Ken Man Cave carrying case. Like the Mad Men styling too. From Etsy seller, That Old Stuff. Plaid wool bell bottom pants not snazzy enough for you? Well, let’s just add a little clown! Ahhh… Much better! From Etsy seller, PMApe. Skateboard sneakers. Enough said. From Etsy seller, Sought Vintage. Oh, how I loved this Fisher Price milk truck as a kid. Even though I didn’t like milk as a kid. I still remember the feeling of taking off those caps. So much fun. From Etsy seller, Mary’s Crochet More. Sweet Shop Vintage is one of my all time favorite Etsy shops for kiddo stuff. And with good reason when she has such adorable stuff as this great crib mobile. Hello, is it this you are looking for? From Etsy seller, Oliver’s Forest. Look, I’m only human. Because I can’t NOT include this little bike friendly shirt with matching red pants to boot! Just one more picture, because you need to see this little nommy hands with bits of nail polish on them. Right? Exactly. From Etsy seller LadiDottie. I love a good cowboy themed kiddo room. And this amazing vintage cowboy chenille bedspread would be perfect for it. PERFECT! From Etsy seller, Box of Hollyhocks. This nautical vintage sweatshirt would look so great with some jeans or cords! Who doesn’t love a good tugboat? What an easy way to add a bit of cuteness to an outfit! From Etsy seller, Dahlia Daffodil. I personally enjoyed just playing jacks as a kid. But who knew it could also be a boardgame? I love that cute little kiddo couple on the front! Tee hee! From Etsy seller, Rocket Taco. FIE! If we’d only known about this book, I’m sure the Peach would have gone as a Fire Cat—what with her love of fireman and kitties! From Etsy seller, Vintage Woods. And also, love that Ken carrying case, so cool! I can’t believe how big Otis has become! What a cutie. I have such a soft spot for redheads. You lucky girl! That jumper is to DIE for! But I’ve already surpassed my October Etsy budget. Hmm. Maybe it’ll still be on sale tomorrow….? Oh boy, that LaDiDottie outfit is so cute….and those fingernails are even cuter! I love that shop!! Love that bed spred!! Thanks so much for including me:) Happy Halloween!! I too, ADORE that bed spread– its way too cool! Everything here is so very cute!! I really love that cowboy bedspread. It’s great how much you guys promote independent sellers. That milk truck was a favorite of mine, too! Had forgotten all about it. Thanks. Happy Halloween!!! We love independent sellers (particularly of the Etsy ilk) and do everything we can to support them! Yay! 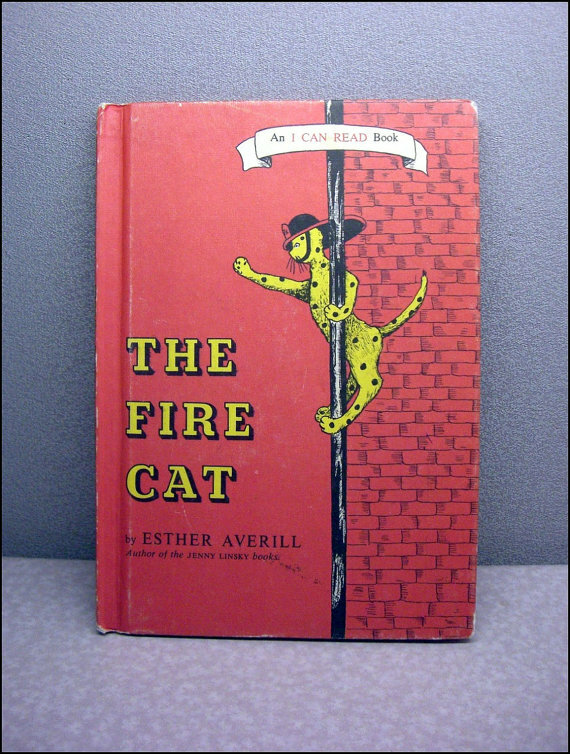 Oh and I looooove The Fire Cat, I remember that book. Oh if only i had a little girl to wear all this cute goodness!!! Excellent finds! I totally remember! That’s probably why I chose it! Hee hee! Of course you have that Ken case, which is the coolest thing I’ve ever seen! I almost bought it because it is so darn kickass! I would totally name a cat Pickles!